Macquarie University is renowned as Australia’s most flexible university. The way we see it, we’re here to help you choose a career, and to help you work towards it. We’re not here to lock you into a career before you even know anything about it! That’s because Macquarie isn’t a rigid ‘Sandstone’ university. We’re a flexible university, built around choice and achievement. Our Executive Dean, Professor Mark Gabbott, explains why studying with us is a great decision, and how we can help you obtain your career goals. Flexibility — When you choose a Macquarie degree, you’re choosing flexibility. The flexibility to tailor your studies to your preferences, with a wide choice of electives, instead of being forced to follow some administrator’s idea of what will suit which career. The flexibility to wait until your second year before you choose a major! The flexibility to customise your program to you and your needs. Business internships — Gain valuable on-the-job experience with business internships that count towards your degree. Turn work experience into credit points and learn how to apply your knowledge. Employment prospects — Prospects for future employment have never looked better. Business and Management graduates are highly sought after and the skills and knowledge you take from your degree are transferable to the commercial world. Exchange programs — Study part of your degree overseas by taking part in one of our exciting student exchange programs. We have the largest student exchange program in Australia, with over 370 participating universities from 53 countries around the world. Travel scholarships are also available. Master business communications skills — Learn critical business communication skills through the Academic Communication unit — a standard part of every Business and Economics degree. A vibrant, flexible, inspiring environment — With high credit point entry requirements and a dynamic mix of students from more than 40 countries, you’ll enjoy unparalleled encouragement, support and inspiration from their peers. 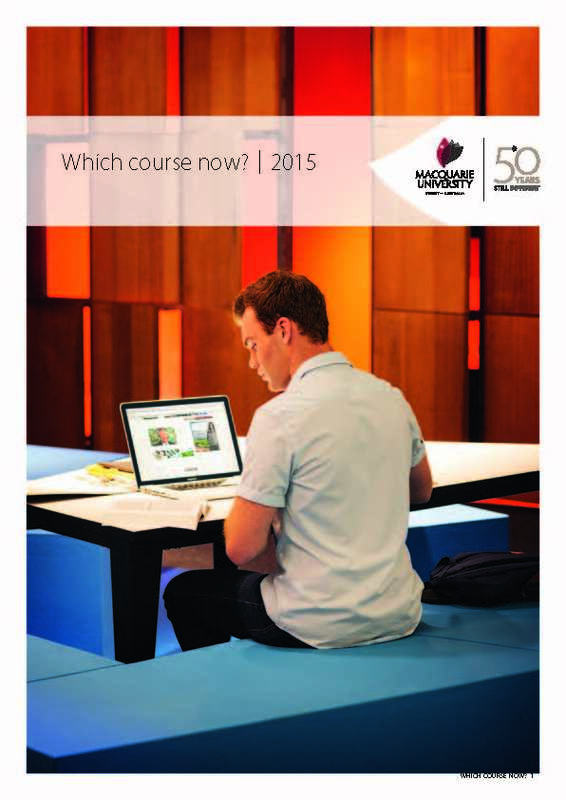 These booklets cover the major degree programs offered by Macquarie University. Within each booklet is a wealth of information on the subject area, the degrees available, the options for study, any accreditation requirements, related subject areas, recommended prior knowledge and career options. 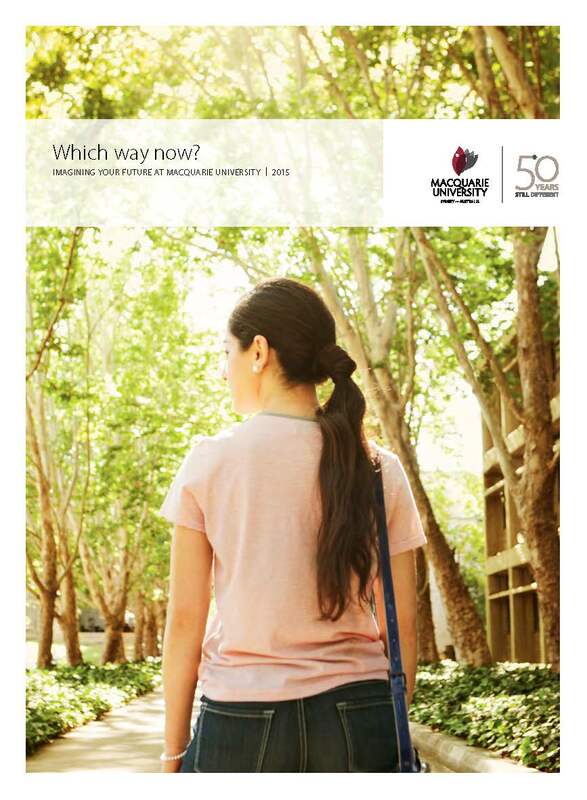 This comprehensive guide to studying at Macquarie University outlines the unique curriculum, opportunities and teaching of Macquarie University, as well as bonus points, scholarships, upcoming events and more. This guide contains specific degree information for 2015, including ATAR cutoff, duration of course, UAC code and what you will study, as well as some career options. Enrolling in one of our degrees is the first step in developing the business and economics skills employers want. Earn more - We lead the field in New South Wales when it comes to above average incomes for our graduates in first-time, full-time employment, particularly in business. Our Executive Dean Mark Gabbott talks how the Faculty of Business and Economics at Macquarie University educates students to be business professionals, helping you to get ahead. Professional accreditation improves your career prospects significantly. We offer a range of undergraduate degrees which are recognised by key industry bodies, so you graduate with more than just a piece of paper. Find out more about our professionally accredited courses. Email or phone the Faculty of Business and Economics administration team for more information. Last Updated: 2015-03-14 01:00:39 by James Fehon.